China Miéville doesn’t follow trends, he sets them. 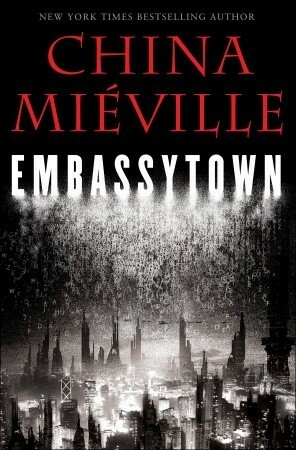 Relentlessly pushing his own boundaries as a writer—and in the process expanding the boundaries of the entire field—with Embassytown, Miéville has crafted an extraordinary novel that is not only a moving personal drama but a gripping adventure of alien contact and war. In the far future, humans have colonized a distant planet, home to the enigmatic Ariekei, sentient beings famed for a language unique in the universe, one that only a few altered human ambassadors can speak. Avice Benner Cho, a human colonist, has returned to Embassytown after years of deep-space adventure. She cannot speak the Ariekei tongue, but she is an indelible part of it, having long ago been made a figure of speech, a living simile in their language. When distant political machinations deliver a new ambassador to Arieka, the fragile equilibrium between humans and aliens is violently upset. Catastrophe looms, and Avice is torn between competing loyalties—to a husband she no longer loves, to a system she no longer trusts, and to her place in a language she cannot speak yet speaks through her. The world that Miéville created is as fascinating as it is confusing. It wasn’t enough to bombard us with ‘alien’ words in every page (vespcam, immerser, aeoli, floaker), but he also chose to change words we already knew by simply sticking them together (yearsend, hedgerow, shiftparent, altreality). Not only did I have to struggle to understand the foreign concepts, but I also had to grasp their significance within the story and to figure out the similar words new meanings. All of this made me feel alienated. That’s alright. Every time we open a book, we as readers are ‘aliens’ to the world contained within the pages. Miéville’s novel puts us in this position by making our role as readers similar to the Ariekei. We’re reading words that we have no concept for and therefore don’t understand. The words are ‘lies.’ But unlike the Ariekei we don’t need a full concept to speak or write of things. We don’t need to make similes real to be able to understand them or use them, because our language isn’t restricted. For example, most of Miéville’s ‘alien’ words I could understand by making similes. Take the word biorigging. We know that bio means life and rigging has to do with supports on a boat. Once we make this connection, every time we see the word we can say biorigging ‘is like something supported by life.’ Not the best example. Let me try again. Take the word politesse (Miéville 43). From the context around it, I can guess the word comes from politeness and finesse. I can then say politesse is to be ‘like a person who is polite and acts with finesse.’ Miéville doesn’t give clear definitions of what biorigging or politesse mean, so all I can do is guess through association or through similes just like the Ariekei. Miéville also assigns different names to concepts we already have names for, like yearsend and exoterres. Again, more guess work, but this time with less uncertainty because I already know what these words mean separated. The first would be the day before New Year, and the second is exo meaning ‘out of’ and terres meaning from the land or earth. However, the aeoli is a concept we can associate. It comes from the word aeolian which has to do with wind. But I still don’t know what exactly an aeoli is. I return to the alienated feeling. Yes, we’re aliens to the book works, but it’s the author’s job to immerse us into that world effectively, and for me, this is where Miéville failed. When I finished Embassytown there were still concepts I didn’t understand.Even when I had a definition and a concept for words like immer and Ambassador, I still felt I was missing some important point. Avice helped the Ariekei to evolve their Language. It’s thanks to her that they gained understanding of the world around them. Miéville’s didn’t bother with explanations (now I get the whole teaching the reader thing) and when I finished Embassytown, I still felt alienated from the story world. Mieville, China. Embassytown. New York, Ballantine Books. 2011. Hi Cassie just wanted to wish you the best of luck on your surgery and recovery. Thank you for being so frank and for all the marvelous books. I'm assuming we get to know more about the Seelie Court since we're following Thule Jace and Ash in Forever Fallen and TWP. I was wondering if we get see Adaon again or get to know more about Nerissa's family? Will we ever get to know how exactly Magnus is acquainted with Adaon? I just really love faeries. #WordUse Series: What Do You Think About Raised vs. Reared? Every post by that one super successful male indie author. (c) 2016 by Amarilys Acosta. Powered by Blogger.